Yes, it's true. Those pics you saw of the 2012 Porsche 911 are the real deal, as Porsche confirmed this morning. With that confirmation comes copious new details on the new, 991-model Porsche, the most comprehensive update to the rear-engined classic in decades. Size: 3.9 inch longer wheelbase and reduced overall height. Weight: Body of aluminum-steel composite construction comprises the majority of its 100 lbs weight reduction compared to the current model. Aerodynamics: Wider, variably extending rear spoiler. Front and rear lift reduced to near zero. Drag (Cd) value remains a slippery 0.29. Fuel consumption and emissions: Around 16 percent lower — using the New European Driving Cycle (NEDC), via features such as automatic start stop, a new seven-speed manual transmission, a new ability for the PDK transmission to "coast," electromechanical power steering (we're nervous about this, considering its steering is one of the current 911's greatest traits), electrical system energy recuperation, and a focus on engine and transmission thermal management. Chassis: Wider front track, new rear axle. Porsche Dynamic Chassis Control (PDCC) active roll stabilization system is available for the first time on the 911 Carrera S. Reduces lateral roll when cornering and helps keep the tires' contact patch optimal. Greater structural rigidity. 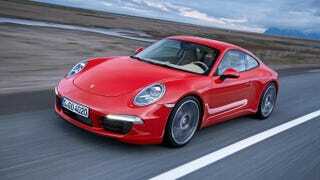 Power: The Carrera S gets a 400 hp, 3.8-liter boxer engine -– 15 hp more than before. Performance: The 911 Carrera S with PDK gets from 0 to 60 in 4.1 seconds. Using the Launch Control function (optional with Sport Chrono Package) cuts it to 3.9 seconds. The 911 Carrera with PDK: 4.4 seconds (4.2 seconds with LC). Top speed for the 911 Carrera S and 911 Carrera is 188 mph and 179 mph, respectively. Interior: Incorporates a similar console as the Carrera GT. Price: 911 Carrera Coupe: base MSRP of $82,100; 911 Carrera S Coupe: $96,400 (excluding destination).